The flashpoint for the gentrification conversation along Portland’s North Williams revolves around the bicycle. The cultural appetite for what the creative class likes and enjoys is in stark contrast to that of the African-American community. “North Williams Avenue wasn’t hip back in the late 1970s. There was no Tasty n Sons. No Ristretto Roasters. No 5th Quadrant. Back then, it was the heart of the African American community. It was wonderfully colorful and gritty.” As the black community saw their own businesses close down through economic disinvestment, they weren’t replaced with new businesses that they regarded as desirable. In the several hours I spent today at Ristretto I have seen roughly a hundred patrons come in and go out, plus others sitting outside on the patios of one of several nearby restaurants. Only three were African-American. As I mentioned earlier, the buildings that surround this coffee shop are home to many African-American families. And yet these new businesses do not appeal to their cultural tastes. This all came to a head over a road project to reconfigure North Williams and Vancouver Avenue. Both are one-way roads a block apart that carry a high volume of bicycle traffic. Vancouver’s southbound traffic flows carry cyclists towards the Lloyd Center and downtown Portland and so sees its heaviest usage in the mornings. Williams on the other hand carries northbound traffic away from the city center which means its highest use is in the afternoons and evenings when bicycle commuters are heading away from the city center. But the focal point of all of this controversy is specifically tied to North Williams Avenue because this is where most of the new businesses are coming in. The tensions of racism and gentrification have culminated in ongoing debates over North Williams’ status as a major bicycle thoroughfare. Sarah Goodyear of The Atlantic Cities (CityLab) writes, “Sharon Maxwell-Hendricks, a black business owner who grew up in the neighborhood, has been one of the most vocal opponents to the city’s plan for a wider, protected bike lane. She can’t help but feel that the city seems only to care about traffic safety now that white people are living in the area. ‘We as human beings deserved to have the same right to safer streets years ago,’ she says. ‘Why wasn’t there any concern about people living here then?’” This picks us on the tension surrounding the North Williams project in general, and in particular the controversy surrounding repainting the traffic lanes to incorporate new designs which cater to the growing number of bicyclists who use this corridor. In light of this, why is North Williams the flashpoint for controversy? The tension and angst is about more than simply repainting a roadway; it embodies the most visual representation of gentrification in inner N/NE Portland. For longtime African-American residents, as expressed above by Maxwell-Hendricks, she and others felt that they had simply been neglected for decades. This negligence took the form of economics, housing, and general concerns of safety. Their frustration is that it wasn’t until middle-class whites began moving into the neighborhood that these issues began to be addressed and rectified. This notion of systemic racism helped created this area and these same forces are at play in gentrifying this once predominantly black neighborhood. For many in the African-American community the current debate over bike lanes along North Williams is simply one more example in a long line of injustices that have been forced upon their neighborhood. Beginning in 1956, 450 African-American homes and business were torn down to make way for the Memorial Coliseum. “It was also the year federal officials approved highway construction funds that would pave Interstates 5 and 99 right through hundreds of homes and storefronts, destroying more than 1,100 housing units in South Albina.” Then came the clearance of even more houses to make way for Emanuel Hospital. For more than 60 years, racism has been imbedded in the storyline of what has taken place along North Williams. For many, the North Williams project is more than repainting lines. As Maus reported, “A meeting last night that was meant to discuss a new outreach campaign on N. Williams Avenue turned into a raw and emotional exchange between community members and project staff about racism and gentrification.” In his article, Maus noted the painful history of Albina as the primary catalyst for the tension today. Lower Albina–the area of Portland just north and across the river from downtown through–was a thriving African-American community in the 1950s. Williams Avenue was at the heart of booming jazz clubs and home to a thriving black middle class. But history has not been kind to this area and through decades of institutional racism (through unfair development and lending practices), combined with the forces of gentrification, have led to a dramatic shift in the demographics of the neighborhood. The history of the neighborhood surrounding Williams now looms large over this project. Now that more whites are moving in are changes taking place. “Some question why the city now has $370,000 to pour into a project they say favors the bike community while residents for decades asked for resources to improve safety in those same neighborhoods. To the community, the conversation has polarized the issue: white bicyclists versus the black community.” But is this issue completely race-related? Portland has been and continues to expand its bicycle infrastructure throughout the city, not just in N/NE Portland. There are also several other main bicycle corridors that receive a high volume of bicycle commuters, but since they do not go through any ethnic neighborhoods they have not created this much controversy. This does not minimize the tension and angst over the North Williams project; nor does it downplay the role that racism has played throughout the history of that community. Note: Footnotes in the original text have been removed. Some hyperlinks have been added. 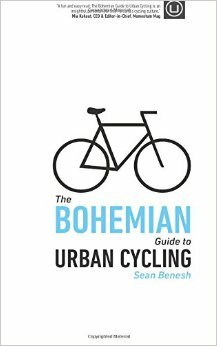 This is a condensed chapter excerpt from The Bohemian Guide to Urban Cycling.